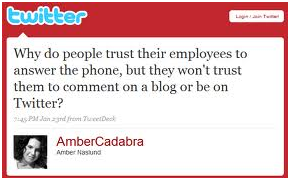 Questions like Amber’s to the left started popping up left and right throughout 2009 when social media empowerment and corporate IT policies were so obviously misaligned. For many companies now, this specific issue has been resolved. However, this is just one of several areas of concern employees have when it comes to having the tools to deliver on an experience promise. Trusting employees with access and information is one of the biggest barriers to enabling your organization to deliver on the ideal customer experience. Most companies run in a top-down manner – the executive team builds the strategy, the mid-level managers design execution plans, individual contributors execute the plan. The problem that often occurs with this management model is that the “why” behind the plan often gets lost in translation between the executive to manager to individual contributor game of telephone. What happens next is storybook – processes are put into place and people don’t know why. They have ideas on how things could be better, but unfortunately because the strategy wasn’t also communicated, their ideas aren’t ‘inline’ and then get shot down. Manager thinks individual contributor is great but has a long way to go. Individual contributor thinks the manager and leadership team don’t know what they are doing and is resigned to clock in and out. What is lost here is the excitement, energy, and strength of ideas coming from the group of people who are closest to the customer. When these employees don’t have the right information and are held back in the details of task execution as opposed to held up and empowered, the customer’s experience is inevitably compromised. It will never be as good as it can be. Your employees need to know that the management and leadership team are behind you. 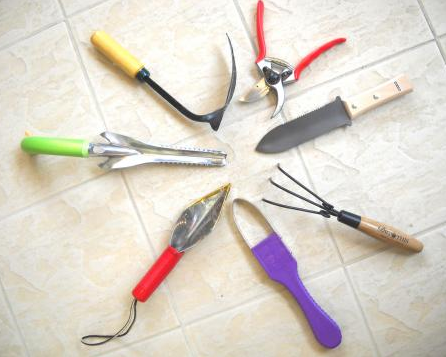 They need to know that you will give them the tools to do their job as best they can. The challenge for you as the experience architect is that you need to help your organization funnel the right kind of information to the right people so empowerment persists. Information is both the easiest and most difficult tool to empower your employees with. Give too much color, and you create confusion. Give too little, and people have to make assumptions in order to fill the gaps. Understanding how you are balancing information overload against maximum productivity is an activity that you should be constantly gauging and readjusting. It will be apparent to you when you lean too far in one direction. How effectively you adjust and re-balance the team is where the skill comes in. I’m not talking about blind trust here – that’s the worst tool you could hand over to your team. You should without a doubt, however, be able to trust your team to execute on the job they’ve committed to performing for the company if you’ve provided them with the right set of tools to do the job. Information and trust go hand in hand. If you don’t provide the right information, then there’s no reason to believe you’ve given your team all of the right tools to do their job to the best of their ability. The experience you are creating for your employees bleeds into the experience your employees are creating for their customers. Seeing representatives from your company engage with customers in public arenas is a sign of transparency. Most importantly, it’s a sign that you trust that your employees are equipped with the right tools to effectively represent your company. What feels more comforting than finally speaking with someone who can actually help you and make your experience extraordinary? Next, we’ll discuss Customer Experience Truth #13 – Even In A 100% Online Business Model, There Are Still Key “Offline” Experiences You Need To Address. This post is 13 of 16 in a Series on CXP Fundamentals. Read more about CXP Bootcamp here.